36 pp. Roman, 1286 pp. 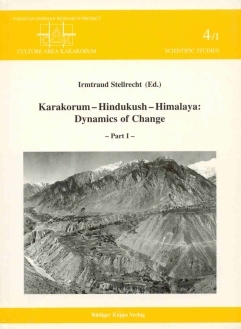 This two-volume edition consists of papers presented by scientists from several countries during the international, interdisciplinary symposium Karakorum – Hindukush – Himalaya. Dynamics of Change, held in Islamabad/ Pakistan in 1995. This symposium was organized by the coordinators of the Culture Area Karakorum research project, sponsored by the German Research Foundation (DFG). Central to the contributions by environmental, cultural and social scientists to this volume are the continuously-changing relationships between man, culture and environment in the high-mountain regions of the Karakorum, Pamir, Hindukush and Himalaya.